The folks behind the effort to bring us Eagle Force Returns have been hard at work sharing updates over the last few days, so we’ve rounded them all up below for your reading pleasure! Let’s get to it! First and foremost, a big congratulations goes to our friend Chris from The Drawn Word on the birth of his son! Both Mom & Boy are doing well and are back at home! Speaking of The Drawn Word, Chris has shared word via the Eagle Force Goldie Hawk Photo Card Kickstarter Campaign Page that a few of you came together to make sure, through hook and crook, that we make the stretch goal for Cat cards! Now, the amount of cards that will be created hasn’t been budgeted as of yet, but a teaser of “The Cat Mission files” was shared and we’ve mirrored it here after the jump for your viewing pleasure. Next up, by way of the Eagle Force Returns Facebook Page comes our first look at a couple of test shots from the molds for the Eagle Force figures…these are VERY VERY early and need work but Fresh Monkey just loves showing behind the scenes images and we’re thankful for it! While we’re talking about figures, an update was made to the Larry Hama Action Figure Kickstarter Campaign Page. The update shares tools that will be used to bring “The Creator” to life and also shares word of the cut off for the backerkit – July 15th. If you want to ADD ON additional items to your order now is the time. Wrapping up the Eagle Force Returns news is a pair of updates for Eagle Force: Monster Force. The Fresh Monkey Fiction Website now has an area dedicated to sharing Bios for characters from Monster Force! The first group of bios includes Declan Van Helsing, The Forgotten King, Dracula and Dr. Rand! Not only are bios available, but Fresh Monkey also shared an early look at The Forgotten King that we’ve also shared after the break. That’s a lot of Eagle Force Returns awesomeness to digest, so once you’ve caught up, join us after the break for discussion already in progress! Eagle Force Goldie Hawk Photo Cards Kickstarter Campaign Final Countdown! 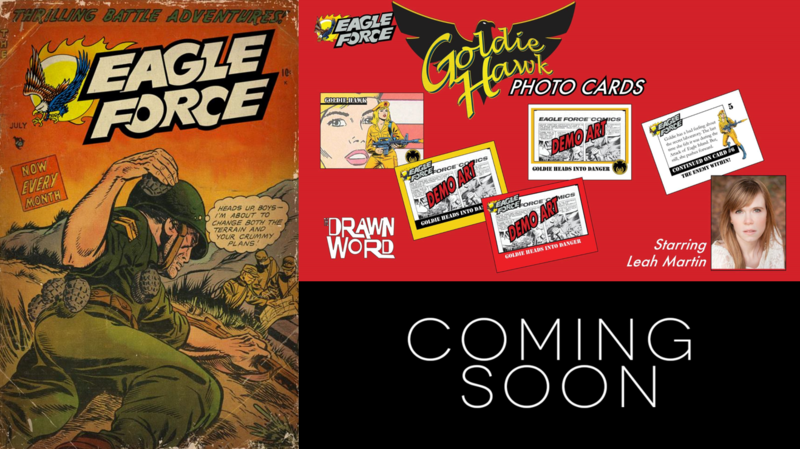 It’s the final stretch for the Eagle Force Goldie Hawk Photo Cards Kickstarter Campaign from our friends at The Drawn Word! Working alongside Fresh Monkey Fiction, The Drawn Word brings us a set of photo cards based on none other than Goldie Hawk herself! Goldie Hawk is one of the standouts in Eagle Force, and it’s high time we give her the attention she deserves! Eagle Force Strikes: Goldie Hawk photo cards will bring Goldie to life through the help of friends at DoubleTake Studio and talented actress/model Leah Martin. The Goldie Hawk pack follows Goldie’s secret solo mission from 1987. Goldie races to answer a distress beacon from an abandoned R.I.O.T. laboratory in Germany. Who and what she encounters will play out in Eagle Force Mega and Eagle Force Returns! You can get the cards in a clear team bag, or with a limited sleeve box. This is a preliminary design, using the original toy packaging art. The final will have a photo image of Leah as Goldie. You can actually get one of two prototypes (seen above) at the Sleeve Box Prototype level! Also, the Drawn Word Eagle Force level is the last chance to get the limited Lost Brigade cards in the Eagle Force Strikes! set, so get them while they last as there’s only 5 left! The Goldie Hawk pack – $15 or more gets this limited pack of Goldie Hawk photo cards. Comes in a clear plastic bag. The Goldie Hawk sleeve box – $30 or more gets the cards in a foldable sleeve box. Final design will have a photo design with Leah Martin as Goldie Hawk. This also comes with the limited Goldie Hawk metal card. The Cat and Bird Level – $50 or more gets the cards in a foldable sleeve box along with the limited first edition of The Cat: Eight Lives Left (personalized by Christopher Irving). Also comes with the Goldie Hawk metal card. SOLD OUT – The Goldie Hawk sleeve box prototype – $50 or more getsthe cards in a foldable sleeve box. Final design will have a photo design with Leah Martin as Goldie Hawk. This also comes with the limited Goldie Hawk metal card and one of two prototype sleeve boxes with a pack inside. SOLD OUT –The Drawn Word Eagle Force Level – $75 or more gets the cards in a foldable sleeve box along with the limited first edition of The Cat: Eight Lives Left (personalized by Christopher Irving). Also comes with the Goldie Hawk metal card. This also includes the Eagle Force Strikes! trading card set with the limited Lost Brigade cards. This also includes an extra pack of Goldie cards in a team bag. The campaign is now only $193 from reaching it’s next Stretch Goal, The Cat Photo Card Pack! Hitting this goal will be like getting two sets of cards for the price of one! Make sure to get your pledge in while you can! Eagle Force Returns Update – Goldie Hawk, The Cat And New Eagle Force Comic! First up, the Eagle Force Goldie Hawk Trading Cards Kickstarter Campaign has only 4 days left to go! The campaign is only $243 from reaching The Cat Photo Pack card set! Once we hit this goal, it’ll be like getting to sets of cards for the price of one! If you’ve picked up previous card sets, then you know that these are quality. If you haven’t jumped in on this campaign as of yet, now is the time to do so! While on the topic of campaigns, our friends at The Drawn Word have sent out some great news – All of the books were just dropped off at their nearby post office today! It was a harrowing fulfillment mission: Staples canceled a crucial order of boxes without advising, Drawn Word ran out of tape, had to go on a box hunt this morning, ironically fight cats off from wanting to lay on everything–but out they are!!!!! Every package should have a white envelope with your RIOT Direktor, Cat foil, and mail-in card form card. International orders got the mail-in card with their order, but have all promised to keep it under their hat for the rest of you. Last but not least, the Eagle Force Returns Facebook Page has begun sharing a new web comic entitled “Shattered Peace”. Page 01 is now available (and mirrored in this post), with a new page being posted every Wednesday! The story is written by Justin Bell and Illustrated by Ryan Lord. You can discuss all the latest Eagle Force news right here on the HISSTANK.com forums after the break! Our friends at The Drawn Word have shared an update via Kickstarter that aims to please! After getting some fantastic input from many of you, the Campaign has been updated with some new stretch goals a few days ago. 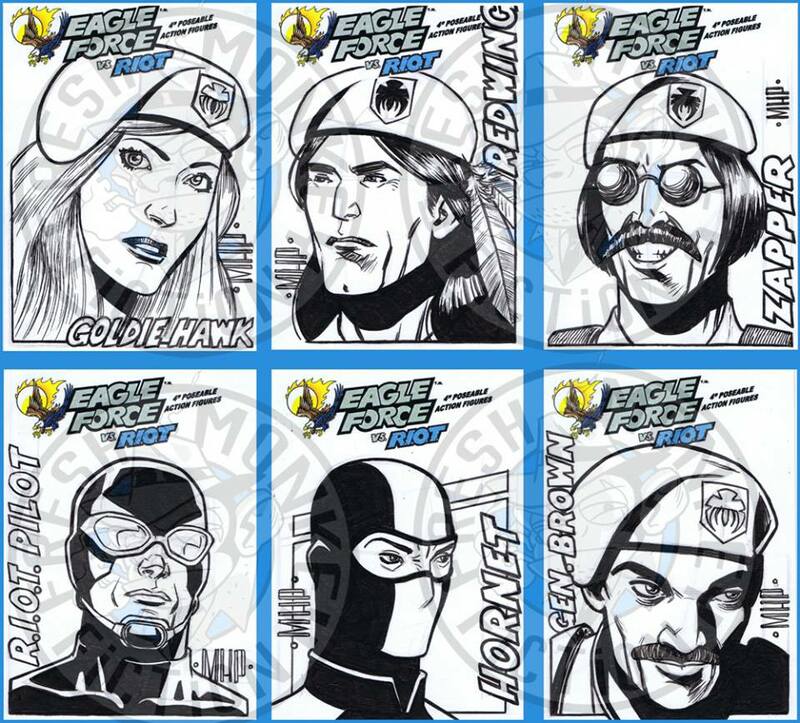 Not only has The Drawn Word included BTS (behind the scenes) cards from both shoots, but also a special Eagle Force Mega character design reveal. Who is he? You’ll find out after the campaign reaches the $2,600 goal and these go out. $2,600.00 – This tier will get us a signed & limited Eagle Force Mega top secret character design, drawn by Chris Irving! So what are you waiting for? Go get your contribution in, then join us after the break for discussion already in progress! Eagle Force Goldie Hawk photo cards Kickstarter Campaign Now Live! Our friends from The Drawn Word have done an amazing job, working alongside Fresh Monkey Fiction to bring us the mythos of Eagle Force. The latest offering from The Drawn Word brings us a set of photo cards based on none other than Goldie Hawk herself! Goldie Hawk is one of the standouts in Eagle Force, and it’s high time we give her the attention she deserves! Eagle Force Strikes: Goldie Hawk photo cards will bring Goldie to life through the help of friends at DoubleTake Studio and talented actress/model Leah Martin. The Goldie Hawk sleeve box prototype – $50 or more getsthe cards in a foldable sleeve box. Final design will have a photo design with Leah Martin as Goldie Hawk. This also comes with the limited Goldie Hawk metal card and one of two prototype sleeve boxes with a pack inside. The Drawn Word Eagle Force Level – $75 or more gets the cards in a foldable sleeve box along with the limited first edition of The Cat: Eight Lives Left (personalized by Christopher Irving). Also comes with the Goldie Hawk metal card. This also includes the Eagle Force Strikes! trading card set with the limited Lost Brigade cards. This also includes an extra pack of Goldie cards in a team bag. The campaign will be fully funded once it hits $1,250.00. From there, the first stretch goal is set at the $2K mark, which gets “The Cat Photo Card pack” made! 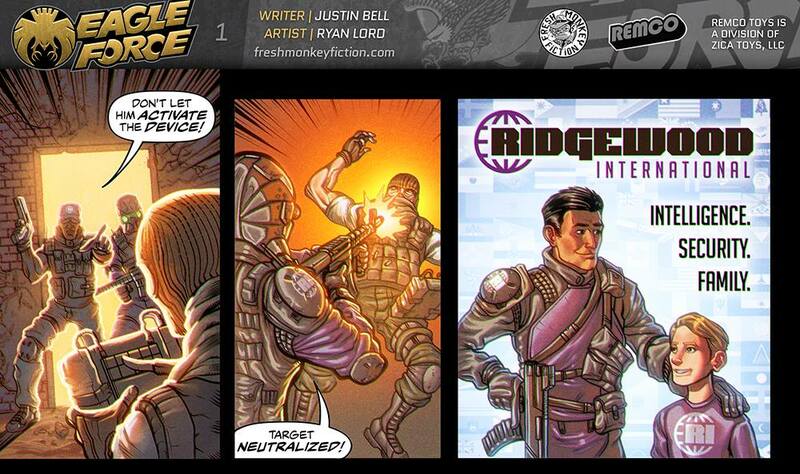 Will you be joining on on this latest Eagle Force Kickstarter Campaign? Sound off after the break! Have you ever been curious as to how Eagle Force began? Eagle Force ’42 looks to answer that question and many more! Our friends from Fresh Monkey Fiction are giving us the opportunity to see how it all began in Eagle Force ’42…starring Sgt. Eagle, Captain Hawkins, Dogtag, Redwing, Santini, The Nameless Soldier, Sparrow, Mariner and G.R.U.N.T.! 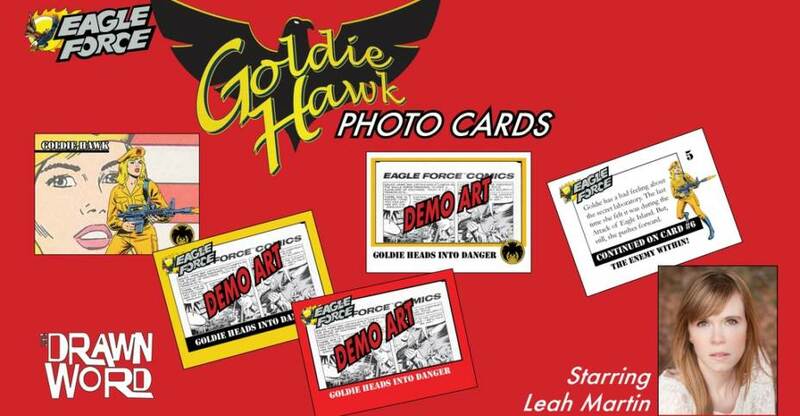 In related Eagle Force news, The Drawn Word shared word of a set that’s coming soon: Eagle Force Returns comes to vintage trading card life with Goldie Hawk photo cards, starring Leah E Martin. With Fresh Monkey Fiction, Shawn Hambright and Joey Tran of DoubleTake! We’ll of course bring you more details as they become available, but for now, share your excitement after the break!